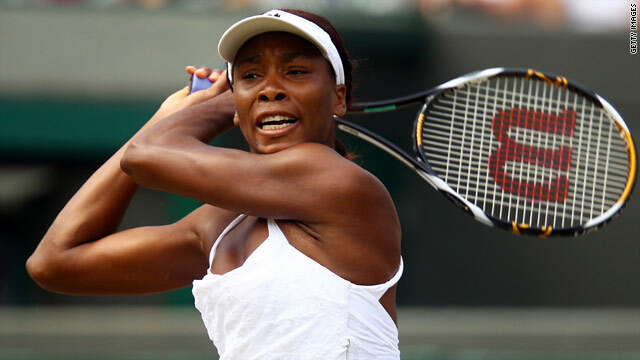 Venus Williams has won the U.S. Open twice but is being hampered by injury ahead of next month's event. (CNN) -- Venus Williams has joined her sister Serena in withdrawing from next week's Cincinnati Open, citing a knee problem that could dent her hopes of success at the U.S. Open. World No. 4 Venus has not played at a tournament since losing in the Wimbledon quarterfinals at the end of June, and said she had experienced soreness while practicing recently. "During the last three weeks I returned to my normal practice schedule, and last week began to experience pain in my left knee," the 30-year-old American told the Cincinnati hardcourt event's website on Friday. "My medical advisors and physio have recommended that I refrain from competition until I am pain free. Unfortunately, I am not at a point where I can commit to competing next week." Williams, a seven-time Grand Slam winner, played at the U.S. tournament for the first time last year, losing in the third round. Eight of the world's top-10 players will be present at the Lindner Family Tennis Center, but No. 1 Serena is still on the sidelines due to the cut foot she suffered at a restaurant that will also rule her out of the upcoming tournament in Montreal. Meanwhile, world No. 3 Caroline Wozniacki moved into the semifinals of her home Copenhagen Open with a 3-6 6-0 7-6 (7-3) win over German fifth seed Julia Goerges. The Danish top seed will next play Russian qualifier Anna Chakvetadze, who beat Slovenian sixth seed Polona Hercog 6-4 6-3. Former world No. 5 Chakvetadze, an eight-time winner of the WTA Tour, has slumped to 74th in the rankings. The other semifinal will be between Chinese second seed Li Na and Czech No. 7 Klara Zakopalova.